Build a City Fit for a King! You are in the running to be the kingdom's next Master Builder, but first you must impress the monarchy with your city-building skills. To succeed, you must enlist help from a diverse cast of characters, and only the best city will earn its steward the title of Master Builder! 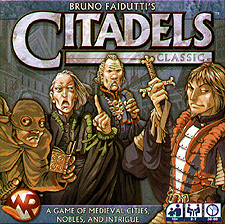 Published in 25 different languages and nominated for numerous awards, Citadels is widely revered as a modern gaming masterpiece. This classic edition of the game includes the original cast of characters and features all of the original art used in the game's first release.